Using the Omega-3 Index test we are able to measure the amount of EPA and DHA in the red blood cells, which allows us to determine if someone has optimal omega-3 levels. The Omega-3 Index (O3i™) Test is a simple, self-administered blood test that measures the amount of EPA & DHA in your red blood cells. The presence of omega-3 fatty acids in red blood cells is a reflection of the amount of omega-3 which is in your tissues and organs, such as the heart. By recording the percentage concentration of omega-3s EPA & DHA in red blood cells, the Omega-3 Index provides a useful indication of a person’s long-term intake of omega-3s. Dr. Bill Harris is an internationally recognized omega-3 expert, co-inventor of the Omega-3 Index test, and president of Omegaquant Analytics. He explains that a low Omega-3 Index correlates with a higher risk of cardiac death, while a high O3i is ideal for maintaining a healthy heart. For a lot of people, omega-3s are associated with having a nutritious and healthy diet. Although one can get a lot of good omega-3s from the right kinds of food, we do not get enough from our diet today. Therefore supplements have become and will continue to be an important source of omega-3 fatty acids. Invented by Dr. Harris and Dr. Clemens von Schacky, the Omega-3 Index was brought to life a little over a decade ago. Between these two internationally recognized experts, they have published more than 250 scientific papers on the Omega-3 Index. An Omega-3 Index of 8 percent or above is considered optimal, while a low index of omega-3 presents a higher risk of sudden cardiac death and potentially other health issues. A recent study published in Nutrients, compared data from the United States and Germany. The study concluded that despite adequate knowledge of the health benefits and food sources of omega-3, 98 percent of the participants fell below the optimal range. Raising awareness around this lack of omega-3 rich diets in the world could be a great marketing opportunity for suppliers – as well as helping raise the levels around the world. Read a study reporting the blood levels of EPA and DHA by countries and regions. We at Aker BioMarine decided to form The O3i Project with several industry partners, such as companies, associations, and non-profits to bring more awareness to the ramifications of having low omega-3 levels – an issue that doesn’t discriminate, is globally relevant, and costs healthcare systems around the world billions of dollars. The ultimate goal of The O3i Project is to get our partners to communicate through their channels about the importance of omega-3s. In most cases, once consumers know their omega-3 levels, they are motivated to act. We as industry leaders have the responsibility to educate consumers and bring awareness to this global health issue. Krill oil, for example, is a great source of omega-3s and studies have shown to raise the Omega-3 Index significantly. We believe anyone selling omega-3s has an obligation to address this public health issue and to help do something about it. Ready to act upon this global health issue? 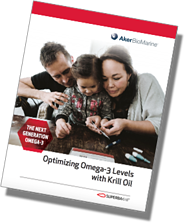 To learn even more about the Omega-3 Index Project, the global situation and how krill oil increases the omega-3 levels significantly more than fish oil, download our whitepaper for free by clicking the button below.